We were invited to a friend’s birthday party and the venue was the garden of the Jaroměřice nad Rokytnou chateau about 15km from Třebíč. 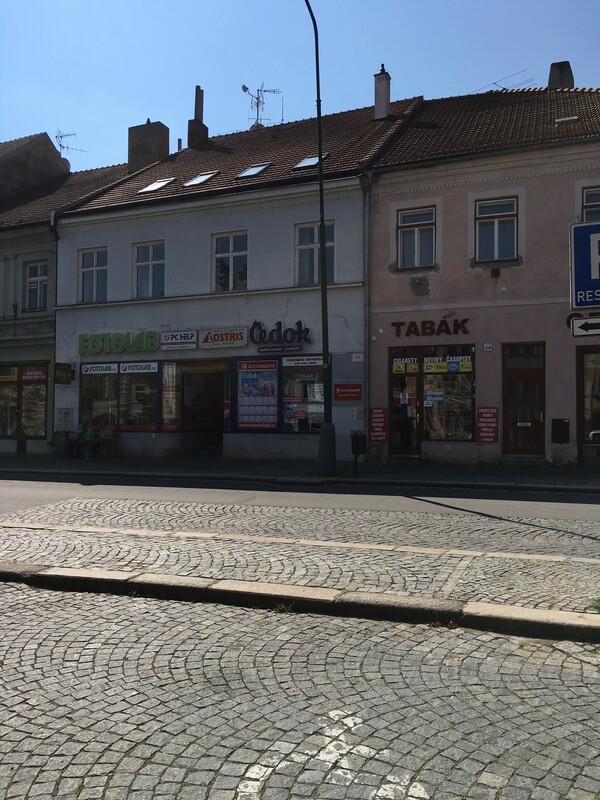 Our friend recommended we stay in Třebíč. I did a quick search on hotels and there weren’t any that stood out. They were also quite expensive. Then I found a website that showed three modern apartments – the price was around 2800Kc for two nights with breakfast. There was no air conditioning and so I took my electronic bug zapping racquet in case of mosquitoes in the night. It took about 2.5 hours to drive from Prague to Třebíč on a Friday evening. The apartment manager asked us to call when we were about 30 minutes away so she could be there to meet us. The apartments are in the main square of the town and that has a large parking area. The entrance is a corridor between two shops – but don’t let that put you off. The picture above is really just to help you find the place. Parking was free, except between 8-11am on a Saturday. But you could pay (90Kc) at the meter on Friday night and get a ticket to save having to get up early and run down for one. There is an entrance door, two flights of stairs (no lift), then an entrance door to the three apartments. The manager was really friendly and spoke English. She showed us the apartment and asked what time we’d like breakfast and what we’d like. We chose 10am, tea coffee, juice, yoghurt, croissants, scrambled eggs. The apartment was clean and modern. There was free wi-fi, a large flat-screen TV and a fridge containing some very reasonably-priced snacks and drinks. A bottle of beer 35Kc, half bottle of sparkling wine 85Kc, Jameson whiskey 50Kc. We were given a bunch of keys; two for the apartment, an electronic key for the upstairs entrance, another key for the downstairs door – there isn’t a manned reception like a hotel. Venturing out into Třebíč, I found that there were lots of wasps around. I was surprised as this year there haven’t really been many wasps – looks like they came to live in Třebíč. I decided to take my zapper racquet to the party the next day as we’d be eating outside – I’m so glad I did as I used it throughout to zap the evil monsters. The double bed was a little bit hard – so if you are looking for a super-soft bed then this isn’t the place. Breakfast was delivered to our room at 10am and was pretty good. We met up with some friends and enjoyed wandering around the town and visiting the historical sights before travelling to the party. Check out is officially 10am but they were fine with us ordering breakfast for 10am and checking out around 11:30am. I guess if there was another guest arriving then you may have to leave at 10 – which is too early I think. I’d definitely recommend this place if you find yourself visiting Třebíč – in fact I’d choose this over the more expensive hotels.